When my son’s chi chi preschool informed me that in order for him to keep his spot in school for the fall he needed to attend the summer session, I was livid, furious, irate! How dare they take away precious summertime with my boy of long days at the pool, running wild at the splash park, and frequent trips to the beach. How dare………oh wait, they’re going to have pony rides and trips to a petting zoo. Dang, can I go? The summer calendar the school’s activities looked way better than me filling up the water table 375 times in one morning. Plus the kid would probably be sick of my face by mid-June. So I conceited and sent him on his preschool way. I knew the kids were going on field trips this summer, but Mommy Brain struck again because I never thought about the logistics of how the group of three and four year olds would actually get to the field trip destinations. Obviously they would load all of the munchkins on a HUGE yellow bus. You know the kind of bus that doesn’t have seat belts. The same buses that are involved in 26,000 accidents a year, but who’s counting? My sweet little boy! How could I let my three year old on a bus? He won’t go! He will be terrified! I need to prepare him because if I know anything, it’s my boy. Walking to his classroom on the day of the field trip, I was still chanting over and over “you’re going to go on a big bus today! Won’t that be amazing?” Before we made it very far, a teacher told us to just head out to the buses because they were ready to leave. I can’t do that! This boy is a man of routine and he doesn’t like when things change. He will be terrified and burst into tears if I walk him over to the bus and then leave! This isn’t how it was supposed to work. No, no, no! I was supposed to drop him off in his class, like usual, and run out the front door. This will be a disaster! We walked up to the big yellow bus, he let go of my hand, and stood in line with his class. What the…? Wait, what just happened? That little traitor didn’t even look back. No tears. No hesitation. Just a big goofy grin and off he went to wait in line with his classmates all decked out in their blue school shirts. This post was pretty funny! wow, good for you! i will be taking my son for a zoo trip in a camp soon. he’s 4 and I hope it’s a smooth one for us. 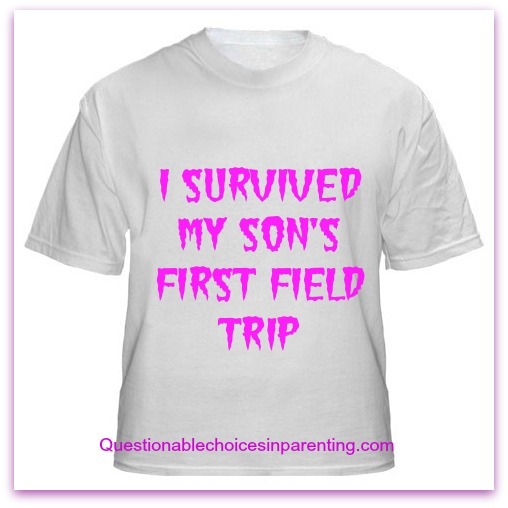 I’m sure you had a blast with fellow parents during the trip.